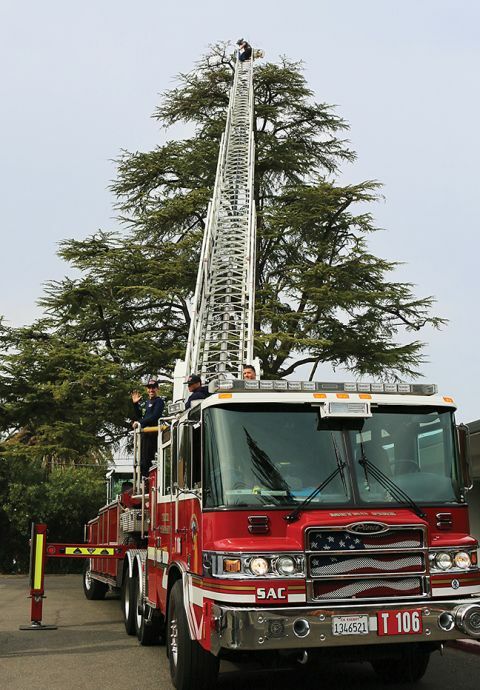 Sacramento Fire Fighters recently helped restore Palm Drive’s Christmas tree star. 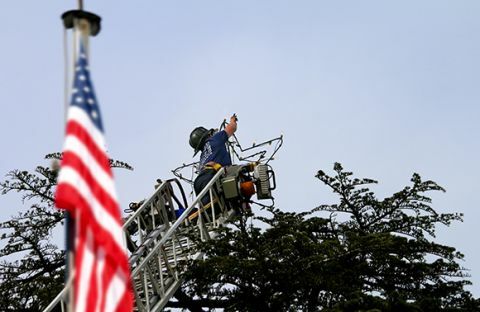 Firefighter Jason Baldwin scaled a 100-foot ladder to replace lights on the Carmichael landmark. CARMICHAEL, CA (MPG) - Stretched by calls to fight Butte County fires, Sacramento firefighters recently found time to foster Christmas cheer at home. Thanks to the officers and Property and Business Improvement District leaders, the old Post Office star on Palm Drive shines more brightly. Located in the central business area, the historical route is lined with Canary palms that community matriarch Mary Deterding planted around 1909. At the same time, her neighbor John Scroggs nourished a deodar cedar. The exotic transplants grew up with Carmichael. Scroggs’ cypress became famous in 1960, when the US Post Office planned a Palm Drive facility. Federal architects sentenced the evergreen to the saw mill. Carmichael’s famed naturalist Effie Yeaw lived yards from the giant and began a petition to save it. Washington DC relented. Marking the community victory, a low concrete wall and a plaque for Effie Yeaw remains beneath the tree. Later in its 100-plus years, the deodar was crowned with a five-foot star whose illumination became a Christmas tradition. Long-time residents recall finding their way home on winter nights by the lofty icon. The ornament shone through many more Decembers after the Post Office moved to Fair Oaks Boulevard. About 10 years ago, its wiring fizzled. The deodar remained dark until last year, when PIBD chairman Gary Hursh beheld its forlorn bauble. “PIBD’s trying to improve the quality of local businesses and our residential environment,” the attorney explained. “We decided the star needed to be relit.” AAA Crane Company owner Gary Matranga rose in a crane basket to string new lights on the stellar frame. As night fell last December, the lights came on again.